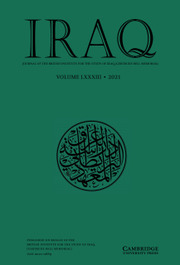 Iraq is an academic periodical founded in 1934 and appearing annually. It publishes articles on the history, art, archaeology, religion, economic and social life of Iraq and, to a lesser degree, of the neighbouring countries where they relate to it, from the earliest times to about AD 1750. Iraq has been a vehicle especially for the art and archaeology of Mesopotamia and for Assyriology. The British Institute for the Study of Iraq has wider interests than its predecessor, the British School of Archaeology in Iraq. Consequently the editorial board is keen to solicit articles from a greater range of academic fields. We welcome contributions on, for example, aspects of early Islamic, medieval and early Ottoman Iraq.